Oh yes, I am going somewhere with this, I promise. I hate wallpaper. It just causes problems. It is too specific, and too hard to change. So, I have now removed all of it from my home. My master bathroom is a lovely room. 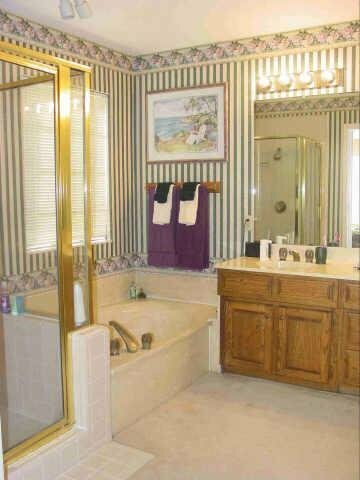 It is a generous 10'x10' and has marble countertops and a marble garden tub, and huge mirror, but it also came with striped wallpaper, and those strip lights that remind me of a Vaudeville dressing room--but somehow, they don't capture the romance and charm of those lights. In addition to the lovely forest green vertical stripes, was a floral border. FLORAL. Nothing in my life or personality could be described as floral. But that wasn't the worst part. The worst part was that most of the border was held in place by clear thumbtacks that the previous owners had apparently deemed acceptable. See what I mean? Now just imagine that behind those purple towels is a tear in the wallpaper, and that the border is also loose...It's obviously a room with potential, no? Sooo, Saturday, I decided to see if that border around the tub would come off. Sure enough, it came off beautifully, So I decided to try the ceiling one. It came off neatly in one long strip three quarters of the way around the room, then RRRIIIPPP...the wallpaper came with it...Ah, the deciding factor governing my weekend warrior chores...Since I had a gaping tear in the wallpaper, I decided it was time to go for it. I pulled down about 75% of the paper in a half hour, until all that was left was well-stuck wallpaper and thin backing. Then I went to Sherwin Williams for some primer and sealed the rest of the paper and leftover backing in, so I didn't have to remove it all. After that dried, I replastered the walls using the same technique I used in my guest bathroom, to texturize the walls (did I ever show you finished pictures of the bathroom?? It looks so good...I will do that soon...). I love doing this stuff. It is such a visible accomplishment. And to top it off, I even taught myself how to install new lighting. And I did it correctly, and wasn't electricuted, and the lights even work!